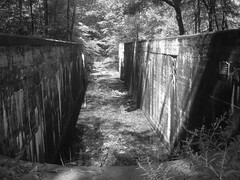 Within Deep Lock Quarry lies Lock 28, which at 17 feet was the deepest lock on the Ohio & Erie Canal, and an old quarry from which blocks of Berea sandstone were cut for the canal locks and other local structures. Ferdinand Schumacher, who is credited with introducing oatmeal to America by supplying it to Union troops during the Civil War, purchased a portion of the quarry in 1879. The sandstone found in the quarry was ideal for mill stones, which were used to remove the outer hulls of oats processed at Akron's American Cereal Works (later Quaker Oats). Stone was last taken from the quarry in the 1930s, when the Civilian Conservation Corps used the sandstone to construct several Metro Parks facilities, including Pioneer Shelter in Goodyear Heights Metro Park. 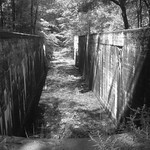 Deep Lock Quarry became a Metro Park in 1934. Today, the park is home to more Ohio buckeye trees than any other Metro Park in Summit County. The old canal bed is home to frogs, turtles and salamanders. A shallow swamp has developed on the quarry floor, where rose pink (an herb) and the invasive narrow-leaved cattail grow.